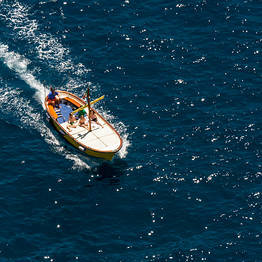 The most common boat on Capri is the gozzo, a low wooden craft with a large sundeck. 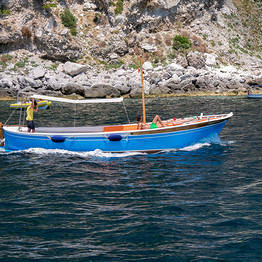 A gozzo is the usually used for trips and tours around the island, as it is both comfortable and stable. 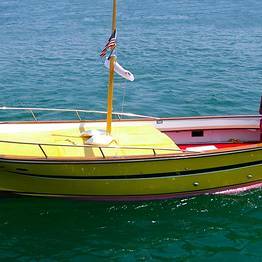 This type of boat is almost always rented with a skipper, as it is not an easy boat to navigate. You can bring food on board for a picnic, or ask your skipper to arrange to bring picnic supplies. 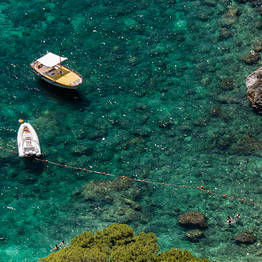 Otherwise, you can stop for lunch at one of the many seaside restaurants on Capri. The best place to pick up a sandwich for a picnic at sea? Try the Da Aldo deli in Marina Grande, famous on the island for his legendary sandwiches! How many passengers can a gozzo carry? Can children take a boat tour on a gozzo? Yes, all boats have lifesavers and safety equipment for children. What is the difference between a gozzo tour and an organized tour? 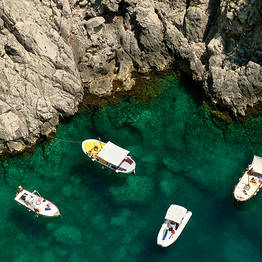 When you rent a gozzo with a skipper, you have complete freedom for the schedule, itinerary, and length of the tour. Your boat is rented privately, so you can decide when and where to stop for a swim (you can also ask your skipper for advice on the most beautiful spots). Organized tours do not include a stop for a swim and you share your boat with other tourists. I'm not sure if I should book a tour for 2, 3, or 4 hours, or a full day. Which is the best option? It takes about an hour and a half to circle the island on a gozzo, so a 2 hour tour does not leave much time for a swim or to visit the grottoes. Three hours is the minimum time you'll need for a leisurely tour, and is the option we recommend for those who are on the island for just one day and want to spend some time exploring by land, as well. A four hour, half-day tour is ideal for those who are on the island for a bit longer, and also want to bring a picnic on board. You can bring food and drinks or request that your skipper arrange picnic supplies (a service that all boat rental companies offer). 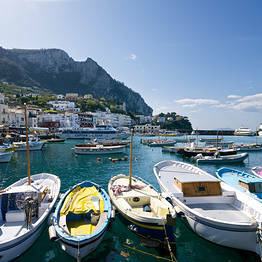 A full day tour is best for those who love being out at sea and are used to a full day on the waves...it's best to break up the day with a lunch break at one of the seafront restaurants on Capri if you have booked a full day tour. 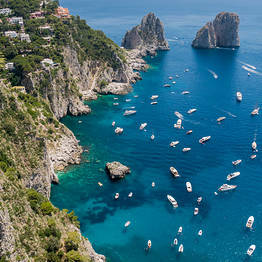 How much does a gozzo rental with skipper cost on Capri? 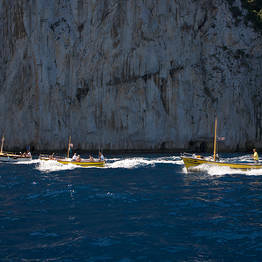 Rental rates for a gozzo with skipper on Capri begin at about EUR 150. 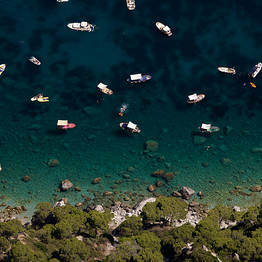 In low season (before May and after September), you can find special lower rates. 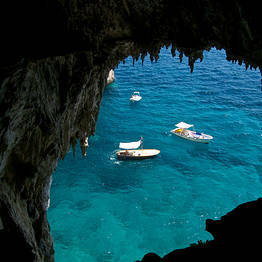 Can you visit the Blue Grotto on a gozzo tour? Of course. Your skipper will anchor by the entrance of the Blue Grotto and you will have to wait your turn to enter after having purchased your ticket (EUR 13). 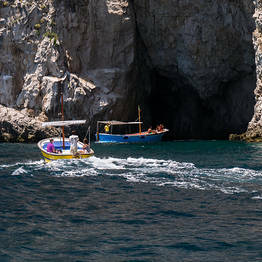 If you want to visit the Blue Grotto, tell you skipper at the beginning of your tour so he can organize your trip to include a stop at the grotto at a time when the wait to enter is shorter. Usually fresh towels are included in a gozzo rental.